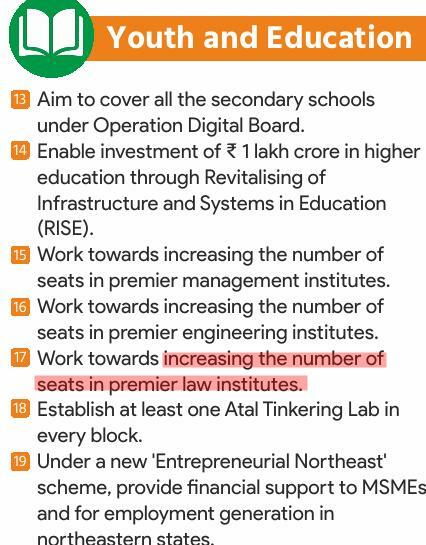 The Bharatiya Janata Party (BJP) has vowed in its manifesto that it would increase the number of seats in “premier law institutes”, even going so far as to highlight it as the 17th in its catchy “75 Milestones for India @75”. We will take all necessary steps to increase the number of seats in Central Law, Engineering, Science and Management institutions by at least 50% in the next five years. We will also motivate States to accordingly increase the number of seats in State institutions. Of course, the central government has only limited sway over state institutions, such as national law universities (though, as it suggests, it can certainly “motivate” a bit influence via the UGC and other channels). However, the Delhi Universities, Banaras Hindu University and others could see a ballooning of law batches if / when the BJP wins. One question is though: are there enough good quality teachers so that these law colleges will not sink into the swamp of mediocrity caused by years of regulatory and government neglect? 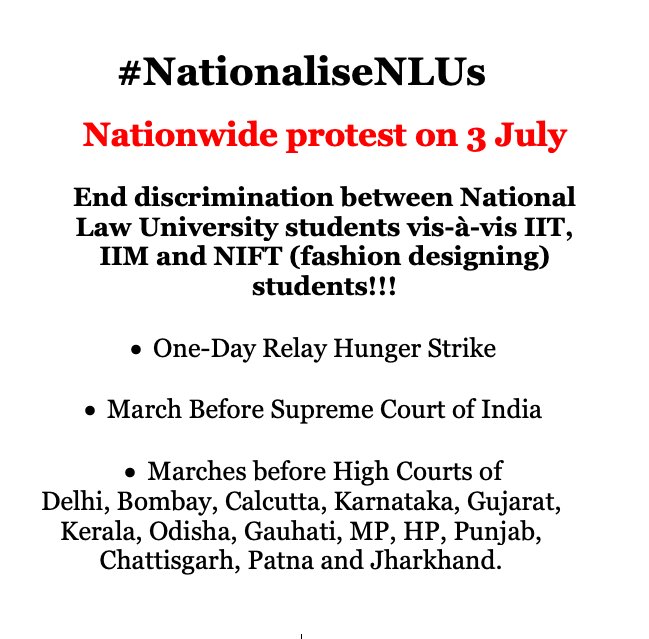 No specific mention of law schools Institutes of National Importance. Nor, coming to think of it, of liberalisation of the legal market either to foreign law firms or foreign universities. It looks like Narendra Modi’s appetite, if it even still exists for liberalisation, will be kept under wraps (which makes sense: there are few votes to be won by advocating for foreigners). More manifesto highlights via Indian Express, or full PDF Manifesto available here. We also had a quick skim of the Congress Party’s manifesto, which has been widely covered and includes quite a few socially progressive promises to improve protection of civil liberties, although no one actually expects that they can win, right? Nothing in Cong’s manifesto that purely effects the legal profession per se, but we’ve picked out a few highlights. 10. In the last 5 years, tax authorities have been given extraordinary discretionary powers that have throttled industry and come to be described as ‘tax terrorism.’ Investigative agencies have mis-interpreted the laws and have instilled fear among businesspersons. Congress will review these discretionary powers and arbitrary actions and take steps to allow industry and business to function with a large degree of freedom. Congress promises to review all laws, rules and regulations governing investments within 3 months. Instruments that are inconsistent with a market economy or outdated or obstructionist will be repealed. Why no march in front of Rajasthan High Court? Jodhpur too hot for protests? Yaar FDI allow karwao koi legal services mein. 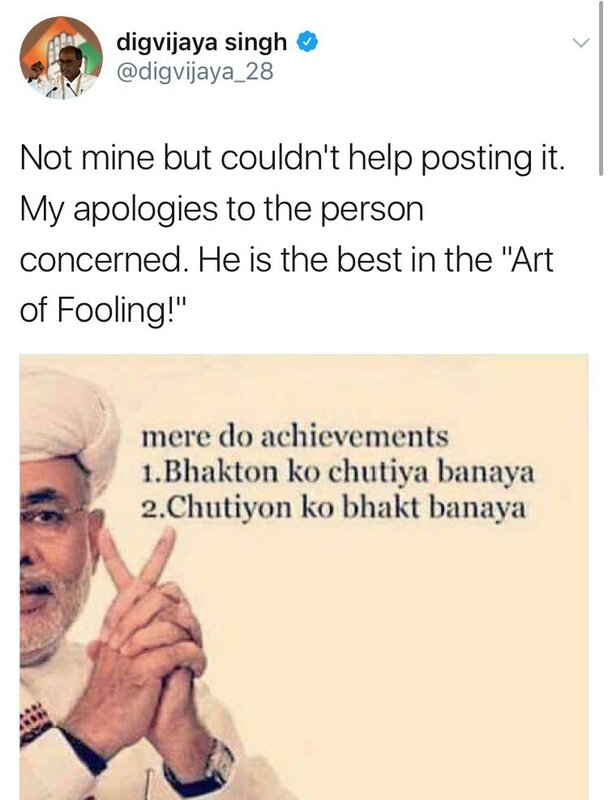 Jo karwaega, mera vote usko jaega. SILF (and/ or its cronies) files an average of 1 complaint per day (or maybe more) to stop lawyers/ law firms directly collaborate with foreign firms/ Big 4/ any other consultancy that brings business. Once FDI is allowed, all these 'Big' 6 and some other will be 'wiped out' overnight. Wiped out = All lawyers will immediately get absorbed by foreign firms, Big 4, etc. and Indian firms with terrible salary : realised billings (ratio) will be empty. Seat increase is fine as it will lead to National status at part with IIT and more funding. This is a good move by BJP. First time any political party is addressing it. PM Modi is the first PM to truly care for legal education. Agree with comment 3. We need FDI in legal services and entry of foreign law firms! Idiot govt, who will you increase seats if NLUs are state colleges? Does your stupid law minister even know that? Dear Modiji, please grant us INI status first.